I have said before that I’m a huge fan of coffee. 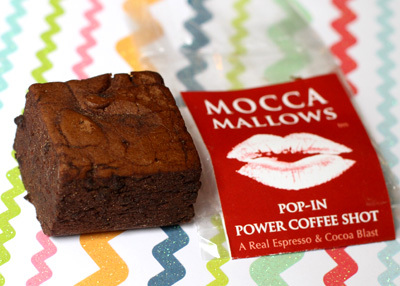 I recently received some CaffeMallows for review… they are a mashup of gourmet marshmallows and a cup of coffee. The packaging boasts that they are a “pop-in power coffee shot.” Caffeine and marshmallows? What could possibly go wrong? Packaging: Cello bag with label. Has a Stickybits barcode which you can use with the Stickybits App. My go-to dictionary, the Canadian Oxford, defines â€œoral,â€ in part, as â€œof or concerning a supposed stage ofâ€¦ (infant) development in which the mouth is of central interest.â€ If this is the case, it would seem that many of us who write for this site never really outgrew the infant stage of development â€“ weâ€™ve never stopped trying to find as many interesting (and hopefully delicious) things to put in our mouths as possible. And apparently, neither have the good folks at Oral Fixation, who continue to provide us with new and increasingly unique flavors of their signature mints. I am, admittedly, not a big fan of sharing. At the risk of making myself appear greedy, selfish, and all-around less likable, I will openly acknowledge here that my own personal philosophy is that every effort should be made to minimize the amount of sharing one ever has to do. Sure, there are exceptions when sharing is okay – sometimes even nice (think first-date milkshake with two straws, cable bills, and household chores) – but as a general rule, I think it’s best avoided. When I received my generous shipment of Ugly Truffles and Damn Good Cookies from Chocolate Gourmet, however, I immediately recognized that the only way I’d be able to review such a quantity of treats in a timely manner, without making myself deliciously ill, would be to invite my friend, a sweet-toothed vixen herself, over for a night of eating chocolate. And oh, what a night it was. Mints have never been at the forefront of my candy addiction. I don’t know if my view is unusual, but I’ve always considered the tiny sugar-tablets more a quick breath-freshener than something tasty and crave-worthy. A flavorful hit in the absence of chocolate or gummies, but not really satisfying in the same way, y’know? Well, if Archie McPhee has anything to do with it, the conversion of the lowly from afterthought to main event is in short order. From grog to garlic, no flavor is off-limits from the Seattle-based novelty maker. 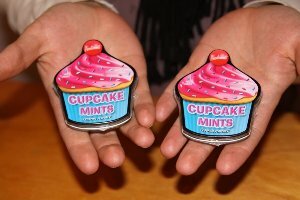 I recently received three tins of mints to review: Cupcake, Mochaccino, and Absinthe. As I’d expect from the company, packaging was kitschy and adorable. But would their taste transcend everyday minty doldrums? 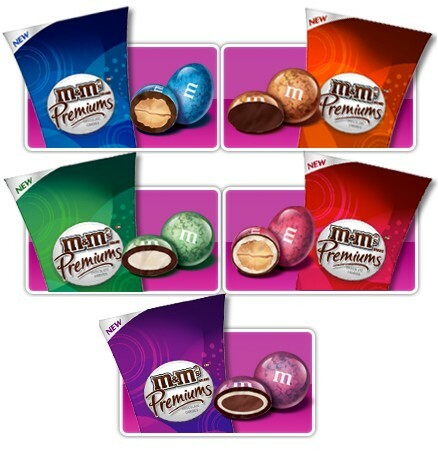 The new M&M’s Premiums line has arrived, and as soon as you see a box you’ll realize that these are no ordinary M&M’s. These M&M’s are something special. From presentation to taste, M&M’s Premiums are quite impressive, hitting the mark in both style and substance. The presentation is fantastic, starting with the outer packaging. The typical M&M’s bag has been swapped out for a sleek, upscale-looking box that is resealable on the outside as well as on the inside, as both the outer carton and the plastic inner pack of M&M’s come with resealable tabs to keep the candy locked in and fresh. It’s a small but wonderful innovation, as it allows buyers to carry, share, and store the M&M’s without worrying that they’ll spill. You can also pour out a handful for a friend and then save the rest for later without having to resort to the old school M&M’s pack method of rolling the bag as tight as you can and shoving it in your pocket, which is nice. The M&M’s themselves are also quite striking: with pearly shells of soft mint green, royal blue, shimmering copper, raspberry red, and a dazzling lavender, the M&M’s provide a lovely visual that I’m sure will be quite popular for parties, gifts, and holidays. Their decorative quality is fancier than your typical holiday-themed M&M, which makes them appropriate candy decor for weddings and other formal events as well. They really are quite lovely. Almost too pretty to eat. Almost. But come on, now. A pretty candy shell isn’t going to stop me from shoveling M&M’s into my mouth in the least dainty way possible. I can’t help it, man! I’m a Candy Addict!